3. Consent to Use of Data. You agree that Apple and its subsidiaries may collect and use technical and related information, including but not limited to technical information about your computer, system and application software, and peripherals, that is gathered periodically to facilitate the provision of software updates, product support and other services to you (if any) related to the Apple Software, and to verify compliance with the terms of this License. Apple may use this information, as long as it is in a form that does not personally identify you, to improve our products or to provide services or technologies to you. 4. Term of License. The term of this License shall commence upon your installation or use of the Apple Software and will terminate automatically without notice from Apple upon the next commercial release of the Apple Software, or December 31, 2007, whichever occurs first. Your rights under this License will also terminate automatically without notice from Apple if you fail to comply with any term(s) of this License. Upon the termination of this License, you shall cease all use of the Apple Software and destroy all copies, full or partial, of the Apple Software. 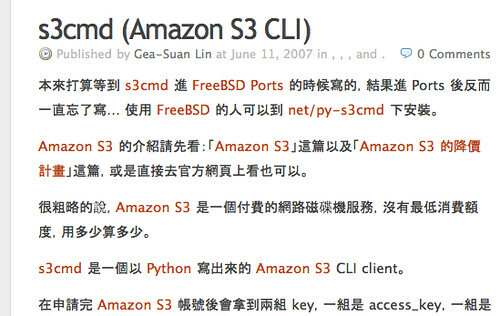 This entry was posted in Browser, Computer, Network, Safari, Software, WWW on June 12, 2007 by Gea-Suan Lin.